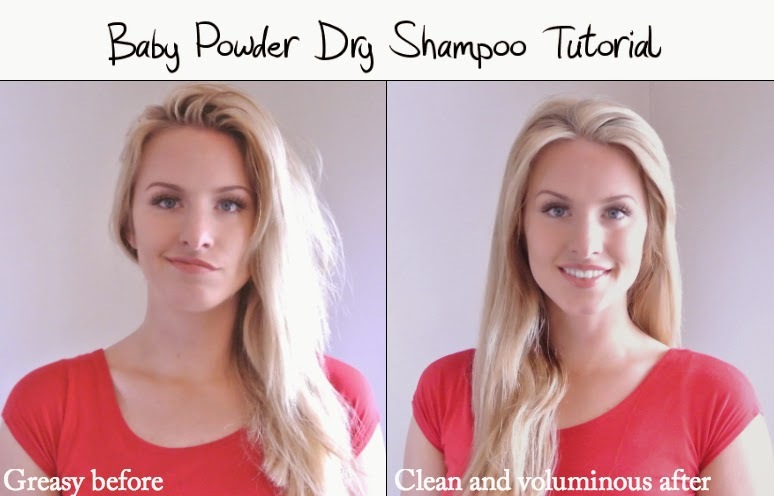 DIY Dry Shampoo: Only requires baby powder! One day in fourth grade I woke up far too late. I threw on the only clothes I could find which were, unfortunately, a tie up shirt and some hand-me-down overalls. I tried to curl my bangs, but accidentally curled them the wrong way so they resembled a half pipe. I couldn’t get them to curl the right way after, so I gave up and went for the headband. 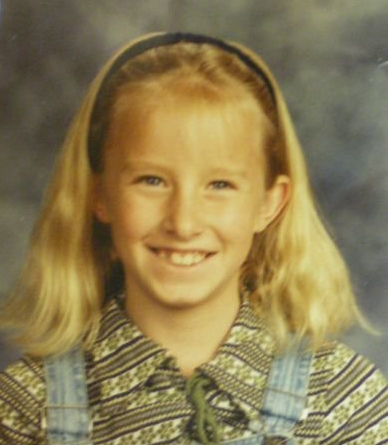 Once at school, I was reminded that it was picture day. Oh great. A bad hair day that will never be forgotten. Because of this, I’m here to share with you one of the simplest ways to avoid a bad hair day–dry shampoo. I keep hearing people recommend different brands of expensive dry shampoo or crazy concoctions of how to make it at home. LET’S BE REAL PEOPLE. All you need is a big carton of baby powder straight from the dollar store. It should run you, well, a dollar. 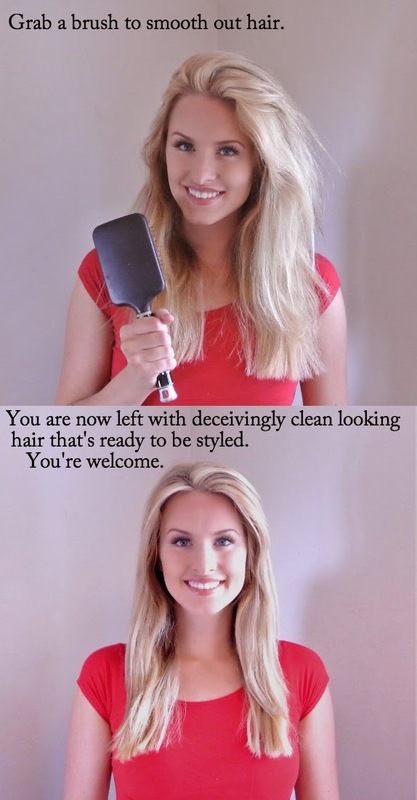 It’s great because, unlike using an aerosol dry shampoo, you don’t have to wait for it to dry. You just apply and go. This does work best for blondes because it it white, though I’ve heard adding cocoa powder makes it suitable for brunettes. Here’s a tutorial of how I use it. I should note that my hair was not only dirty in the first picture, but I added a crap load of shine spray to make the results more dramatic. Baby powder is essentially corn starch with fragrance. You can use corn starch if you are in a bind. I have totally done that before, it just doesn’t smell as nice and is harder to apply because you cannot puff it out of the bottle. I warn you against turing the bottle upside down when you apply the baby power, it will give you way too much product. Just gently puff it on while holding bottle vertically or slightly angled. I have been doing this forever!!! I love it!!! What I do for application is put a dollop size amount in one hand ( it’s best to put it on the locked fingers part) then I transfer the powder to my other hand/fingers. 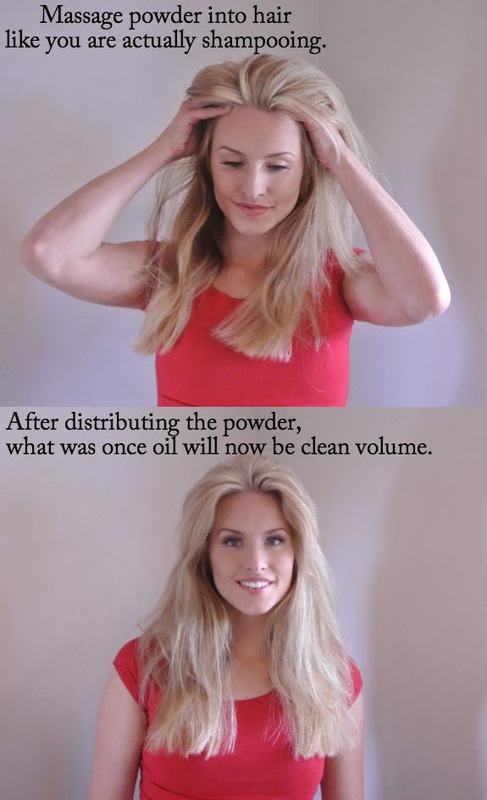 Using the residue of the powder from the original hand I rub that into my hair roots. Then I transfer the powder back to the original hand and use the residue from the now free hand and rub that on my roots. I go back and forth until the powder is gone. It works really well for me and is super easy and fast once you get the hang of it. Before I discovered baby powder I used baking soda- not as good: ) I love your posts Kara! Thanks Emily! That is great advice and seems like it would go much faster! Ooh I use it but just on my fingers. I’ll try puffing it out now; thanks for the tip! Those babies will get you! I remember feeling like I had a great day just because I got a shower! Maybe try the cocoa powder to help it blend with your dark hair.